Home Brands Precision Black or red? 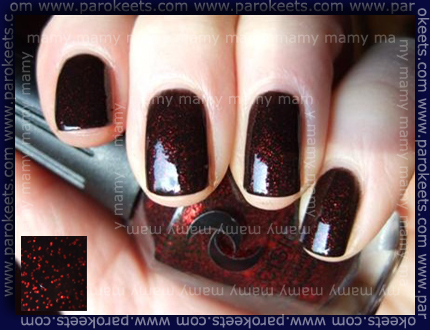 My new acquisition is nail polish with black base and lots of bold red glitter. I’m talking about Precision 05 Rebel Red in You. Application was difficult. First layer was very watery – it looked almost dirty. Second layer looked better, but third one was the same color as in the bottle. Something special. I especially liked that it dried very quickly. When sun touches the polish, it flares up. It reminds me of late evening afterglow, right before evening becomes wrapped in a shroud of night. Depth of this polish just calls for little black dress and high heels. uau!! čudovit je! Spominja me na Jessicin Crimson new drop, le da je ta temno rjav z bakrenim šimrom, tvoj pa črn z rdečim. Noro lep je! Lep. :wub: Na soncu mora izgledati naravnost fenomenalno.